Open Access (OA) Week 2018 is October 22-28. Open Access is the growing model of scholarly publication based on sharing. Open Access means free, immediate access to scholarly material in full. Writing can be published on an institutional repository (“green open”) or published in a completely open journal (“gold open”). It’s a reversal of the old model, where university faculty and researchers write articles, publish them in commercial journals, and the library has to buy them back for other faculty and students to read. That’s paying for it twice–-in the researcher’s salary and the library’s money! And the publisher owns the article copyright and can decide when and how it’s used and reused-–the writer has very little further control over its use. The Internet provides a quick and simple way to distribute information to the world at a minimal cost, where organizations and individuals see their research get the widest possible audience. Universities, libraries, and researchers worldwide are getting behind this new model of scholarly publication. Open Access Week is a great time to learn about this powerful new model for publishing and distribution. Code With Us in 2018! Join the Monroe Library for a hands-on introduction to computer programming at our Hour of Code event! We’ll have fun introductory computer programming activities to choose from. Anyone is welcome to attend. Please help spread the word to anyone on campus who you think may be interested! We’ll be following up in the coming weeks with a Research Guide; have a look at last year’s guide for more information. We’re also looking for participants to help lead coding activities; let us know if you’re interested! The hour you spend working through the tutorial is just the beginning – you’ll also be directed to free online resources to continue learning independently. No experience is necessary, and all are welcome! Feel free to bring your own laptop and headphones if you prefer to work on your own machine. We’ve made a few changes to the library’s space this summer, but you might also notice some touch ups we’ve made to the online search tools available on our home page. You’re probably already familiar with QuickSearch, the default search box on our landing page. It lets you build a search that looks through ALL of our print and digital holdings, both full-text and citation-only. But you might want to take some time to get to know Enterprise, accessible from our landing page by clicking on the “Catalog” tab. Like the old Classic Catalog, Enterprise still lets users search ONLY for ebooks and for resources that we have in the library itself (scores, LPs, DVDs, etc.). Because we anticipate that people will have questions about this new search interface, we’ve put together a Q&A to explain what it can do for you. Scroll to the end of this post for a link to our video tutorial. Why not just keep the old Classic Catalog? It’s not that we’re shallow, but Enterprise is much easier on the eyes. Print is bigger, search boxes are roomier, and strategic use of boldface makes item descriptions easier to skim. Enterprise retains the functionality of the old catalog interface, its useful features are easier to find and set so everyone’s more likely to take advantage of them. Can I still search by a specific format, like scores only or etextbooks only? Absolutely! Just use the leftmost dropdown menu on Enterprise’s search bar. For example, you can search for DVDs only or just for physical reserves. There’s also still the same surgical precision that we were used to with the Classic Catalog – you can still search by keyword, author, title, subject, ISBN, and other options. With more recent print and electronic books, you’ll notice that users can click on a Google Preview button on the right hand side of the item’s record. This means that you can automatically look through some of a book’s actual content to see if it’ll be useful. Since not all books are contained in Google Books, this won’t be an option in every case, but it’ll still save you valuable research time. Are journal articles and databases included in an Enterprise search? They aren’t, but if you’re looking to do a broader search that also includes these kinds of resources, you’ll be better off using QuickSearch. If you want to see whether the library owns access to a specific journal title, our trusty Journal Finder tool will come in handy. It’s located just below the search box on our home page. My Enterprise search just turned up 72 pages of results! Can I filter some out? Totally. This is one of the more exciting and useful of Enterprise’s new features. Just look for the sidebar to the left of your results list. You can quickly and easily filter to include or exclude by name, material type, location in library, subject, and date. To see Enterprise in action, click here for a brief tutorial. Check Out the Library Catalog’s Makeover! Anyone who’s used our Classic Catalog interface to look for library materials might have noticed that its appearance is a little retro. This is about to change, as we’ve given our old catalog a makeover that updates its look and makes it a lot more user friendly. Classic Catalog has served us well, but we think everyone will be excited by the improved experience they’ll get with our new catalog interface, Enterprise. It lets you do almost everything that Classic Catalog could do while also adding some great new features. One of the first things you’ll notice about Enterprise’s landing page is its rotating gallery of new materials in our catalog. Click on the button next to any new title in the gallery to see where it’s located in our collection. Alternately, you can change over to see galleries of faculty publications. This new front page lets you browse and keep up with the materials we’re adding every day. Plus, it keeps the same navigational capability but with more intuitively laid-out buttons and links that enhance usability. Enterprise’s search functions are as robust as our old catalog’s, but fields are bigger, and buttons and drop down menus have larger print, which makes it much easier to click your way through to the results list. It’s also easier to find links to log in to your library account and to find relevant library information. Put simply, there’s just more room to breathe! One change you’ll see is that, while the old catalog required an AND between words to fully search all of the catalog fields, in Enterprise, you just enter the words without anything in between. Probably the most exciting thing about Enterprise is its added filtering options. If you’ve ever dreaded wading through several hundred results with the Classic Catalog interface, you’ll be relieved to hear that the new catalog has amped up filtering features that let you sift through and categorize your results in seconds. For each search you run, results will be sortable by author, material type, subject, and date. That means if you’re looking for a DVD and not a book, or if you know you want the high voice edition, you can cut through the clutter of too many results and find your item faster! Because old habits die hard, we’ll be leaving Classic Catalog up through the end of June. But we hope you’ll take this chance to check out the new kid on the block — Enterprise. We’ll be working all summer to fine-tune and optimize it for a prime-time debut in the fall, so please give us your feedback! Presenting Monroe Library’s Research Competition 2018 Winners! Each winner received a $200 award for the superlative and innovative research projects submitted. Monroe Library holds the contest each spring and is happy to honor the outstanding research conducted at Loyola. Congratulations to both student scholars! With material drawn from hundreds of institutions and organizations, including both major international activist organizations and local, grassroots groups, the documents in the Archives of Sexuality & Gender: LGBTQ History and Culture since 1940 present important aspects of LGBTQ life in the second half of the twentieth century and beyond. The archive illuminates the experiences not just of the LGBTQ community as a whole, but of individuals of different races, ethnicities, ages, religions, political orientations, and geographical locations that constitute this community. Historical records of political and social organizations founded by LGBTQ individuals are featured, as well as publications by and for lesbians and gays, and extensive coverage of governmental responses to the AIDS crisis. The archive also contains personal correspondence and interviews with numerous LGBTQ individuals, among others. The archive includes gay and lesbian newspapers from more than 35 countries, reports, policy statements, and other documents related to gay rights and health, including the worldwide impact of AIDS, materials tracing LGBTQ activism in Britain from 1950 through 1980, and more. The archive is vital for scholars and researchers focused on gender and LGBTQ studies, women’s studies, American studies, civil and human rights, journalism, social movement history, British twentieth-century history, and more. Materials include magazines and ‘zines, photographs, press releases, memos, and government publications. Browse by collection, visualize results and save documents. Search by itself or as part of Gale Primary Sources. 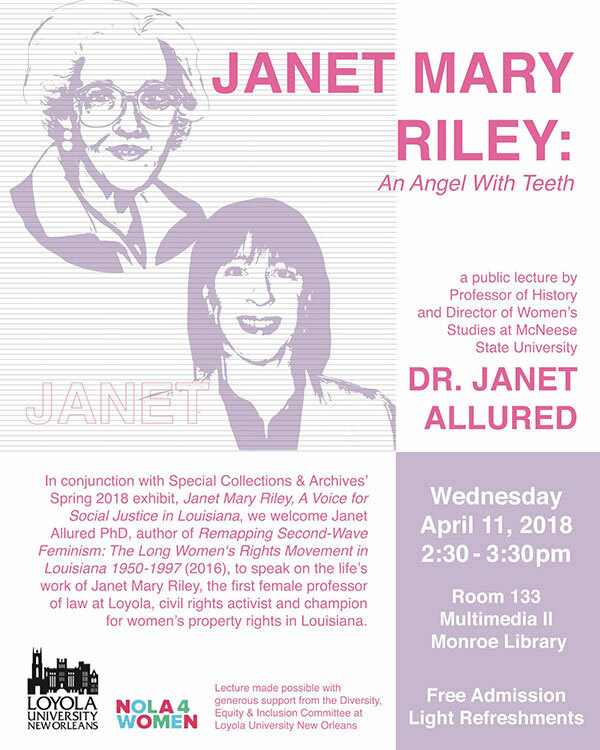 Janet Allured, Ph.D. will present the lecture “Janet Mary Riley: An Angel with Teeth” in conjunction with Monroe Library’s Special Collections & Archives exhibit “Janet Mary Riley: A Voice for Social Justice In Louisiana” as part of the citywide NOLA4Women exhibition series that seeks to celebrate generations of women who have built and rebuilt the city of New Orleans. Janet Allured is Professor of History and Women’s Studies at McNeese State University. Her latest book is “Remapping Second-Wave Feminism: The Long Women’s Rights Movement in Louisiana, 1950-1997” (University of Georgia Press, 2016). She is currently at work on a monograph about southern Methodist women as progressive reformers, 1939-2000. Janet Mary Riley, Loyola alum and first female law professor in New Orleans, remained dedicated throughout her career to protecting the rights of the disenfranchised in Louisiana. Riley’s papers housed in the Special Collections & Archives at Monroe Library Loyola University New Orleans are the focus of their new exhibit showcasing letters, publications, awards, and legal achievements that bring Ms. Riley to life in her own words. This lecture is brought to you through a Loyola University New Orleans Strength in Diversity grant. We’re so happy to see how many people have checked out items from our Black History Month display. If you’re someone who’s enjoyed one of the books from the display or if you’re curious about what else the Monroe Library has on African American history, check out our research guide. It includes tabs for historical newspapers, electronic resources, encyclopedias, music, and movies. And if there’s something you wish we’d included in our display, contact one of our subject librarians to make a suggestion. to pick up an Extended Study Pamphlet at Monroe Library’s Learning Commons Desk. Also, visit the Relaxation Station at the front of the library; pencils, coloring books, games! Good luck on all your final exams and projects!